And, what about crocheted ponchos. Are those actually worn too? I know one woman who wears a poncho with a turtle neck that she knitted herself. It’s a stunner and in a very practical olive green color. So, please let me know what’s the reality in your family, your part of the country (or world), and among folks you see on a regular basis. I do know that one of my bonus kids was quite fond of the fingerless mitts I made for him as he is an on-air newscaster and had to be outside in all kinds of weather and still actively function with his cell phone and video camera. He wore the fingerless mitts inside his heavier, warmer gloves, but took those off when he got to a scene where he needed his fingers to get the work done. What about you and those you’ve crocheted for or observed? I own about a dozen pair of fingerless gloves and wear them 3 seasons almost daily – I just ordered a shawl on etsy and though colour wasn’t quite what I wanted not only am I planning on wearing it but I’m ordering another one in colour I want! I never see anyone using any of these items but then it doesn’t get especially cold in Sacramento CA so that might be why. I only use free crochet patterns on line when I see something on Pinterest and I go to get the pattern it peeves me to find it is a pay for or join this web site to get these patterns. I love my fingerless mittens, wear them all the time. And have sold quite a few pairs too. I love the ponchos, but probably more for a child than an adult. Seem to of old fashioned or something, I guess! I wear my shawls all the time, and my 15 yo granddaughter wears the shawls, ponchos, and mitts. She wears the shawls like a scarf, and likes mini-ponchos that come down to her elbows. She says the classrooms in her school are cold. She wears the mitts to keep her hands warm. She like lace designs and yarns with sparkle. Hi. Good question. I love lacy, intricate patterns and make scarves, rectangular shawls, jackets, sweaters and afgan/lap blankets with them. I wear my creations and get numerous compliments. I have no use for fingerless gloves -only my fingers get cold due to Reynaud’s- or caps and ponchos, therefore I don’t make any. I live in the UK and I wear my smaller shawls the wrong way round my neck, like a neckerchief. I love fingerless gloves (texting mitts). I use a crutch and find full gloves problematic. These are much better. I put shawls round my shoulders at home but don’t tend to wear them out. I also wear ponchos as they are brilliant in the house and out on a crisp morning. Hope this helps. I love making both! Shawls are brilliant for someone like my gran who is 94 and always feels the cold. I use the finger-less mitts when I am on the computer in the winter. I like it cool, so I save on the heat by keeping the computer in a cool room. But sometimes, it’s a bit tttooooo cool, so I put the mitts on instead of turning up the heat. 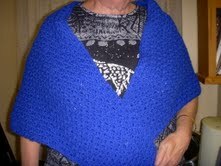 I made shawls for people but they never wore them. I got two of them back still new when the owners passed. I used to wear them but got tired of the negative comments like why are you wearing a blanket? My DIL did ask for one and she wore it. These were all lacy triangle shawls made in shell stitch. Well made too. I have wondered the same thing about shawls. So many patterns, so few seen on people. I do see some mitts but with text-enabled gloves available at every price point and cigarettes becoming extinct, not so many. I made fingerless gloves for me in worsted and I plan to wear them. My husband was in the hospital right before Christmas and the practical nurse saw me making them and loved them. I gave her the pattern and showed her how to crochet in the back loop. I am ready to try a pair in sock yarn. I think rectangular shawls are dressier less old fashioned than the triangular. Never worn a poncho. I like ruanas. I never where mitts, and very rarely where shawls (I keep a couple at work to ward off the air conditioning chill) but I wear ponchos all the time! Here in WI. the fingerless gloves/mitts are high in demand by girls for texting oh and to look cool! Women use them as driving gloves and for texting they like both the pretty lacy ones and the warmer ones. As for shawls younger women like the pretty lacy ones to go with their open shoulder dresses in fall, older women like both in fall to enjoy the cooler weather outdoors and to wear in the home. I personally like both. As for ponchos they are becoming more popular with the younger ones. I have one friend that makes and wears the shawls made with sock yarn, though she wears them as a cowl to keep her neck warm. Other than that, I have never seen anyone wear them, though they look beautiful. I have made ponchos and short capes for the nursing homes. The people there are many times chilly on their shoulders and arms, and the ponchos are just the ticket to keep them warm. I have a pair of fingerless mittens that I made for myself out of worsted weight yarn. They are great for driving while the car is heating up in the winter. I wear the fingerless gloves in the fall/winter especially at work where the temperature can vary. I have a shawl across the back of living room chair as I quite often get cool/cold around my shoulders (since having surgery for breast cancer 9 years ago) and the shawl is just the right warm cosy feeling for late evenings. Laceweight shawls on the smaller side I bunch up and use as scarves under jackets and coats. I have two or three larger ones – one I keep in the office for when it’s cold and I’ve worn the other out a couple of times. I have a third I made for a specific dress/occasion – wedding – it’s really only been worn that once. Fingerless mitts – wear all the time. I keep a pair in my office when it’s chilly in here; can still type but hands are warmer than without. I have a pair in the pocket of every coat/jacket – they are better than regular gloves/mittens for driving, as I retain better grip on the steering wheel and can manipulate small things like keys, money, and my phone better. I’ve made countless pair – the students in my office all begged for pairs (not just the girls!). I made a few in acrylic for a student worker who also worked a drive-thru at a coffee shop; she couldn’t wear real gloves but the fingerless mitts were fine and she was the envy of her coworkers whose fingers continued to freeze working the window. The longer styles are great for helping to keep wind and cold out of your coat/jacket sleeves. I make and wear fingerless gloves a lot! Not so much shawls, though — but my knit/crochet group members tend to shawls/shawlettes as large scarves in the winter. I made my first crocheted poncho (alpaca blend) last winter and loved it, very warm. Am looking forward to wearing it again when it gets colder. I’m finishing up on another one I made that’s a little more open stitch and lighter weight. I also recently made my first shawl which I never thought I’d be interested in making one let alone wear one. It is oversized and very light weight and I love, love, love it so much so that I made another one out of wool and organic cotton for colder weather, both are nice enough to wear out but made for in-home. Will soon start a Tunisian shawl which is a bit more dressy to wear out that I have the pattern and yarn for, and have patterns for the fingerless gloves that I want to make for my 13 yr old niece and maybe a pair for myself. I’m also planning on a couple cowls. I have RA and along with this I shattered my right wrist a couple of years ago and now have osteo arthritis added to the RA and making it very painful in the cool weather. Fingerless mitts aren’t just a option – they’re critical! I have a beautiful long, lacy shawl that I made about 20 years ago and all the ladies in the family loved it so much I’ve made it at least 2 dozen times since then. It’s still a little better suited to dressier times. I love the warm, simpler ones too but I adjust them by stitching in ‘arms’ so they stay up on my shoulders a little better. Love them when I’m working at my desk and can just slip it on or off whenever needed! 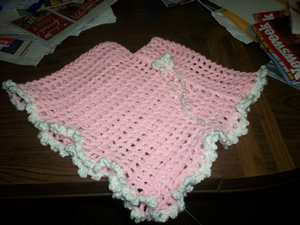 I crochet for my church Shawl Ministry. I crochet all types and yarn weights. Both rectangular, light and heavy. Smaller ones for children, but very few ‘lacy’. I crochet mittens mostly for self use. When winter comes and the dogs need walking! I have never used first five fingerless gloves. I do wear small shawls as a scarf. I don’t see a lot of shawls being worn. I make and wear and give many scarves and ponchos fingerless gloves too. I have a LOT of free patterns. Have bought a lot too.. I wear shawls often in air conditioning or when it is too cold for just a long sleeved shirt but too warm for a sweater. I see other people wearing manufactured shawls often. I am planning to crochet a poncho soon as I think they will be easier to wear while cooking and doing housework and walking the dog than a shawl.